When the temperature dips below freezing, it’s time for snowmen, hot chocolate, fires, and decorative beanies. While these things make us happy and are some of the perks of living in a location that experiences the winter season, this weather, often, can take a toll on your car. This is mainly because metal and cold temperatures don’t work well together — cold makes metal shrink and act a little bit differently than it would in warmer weather. 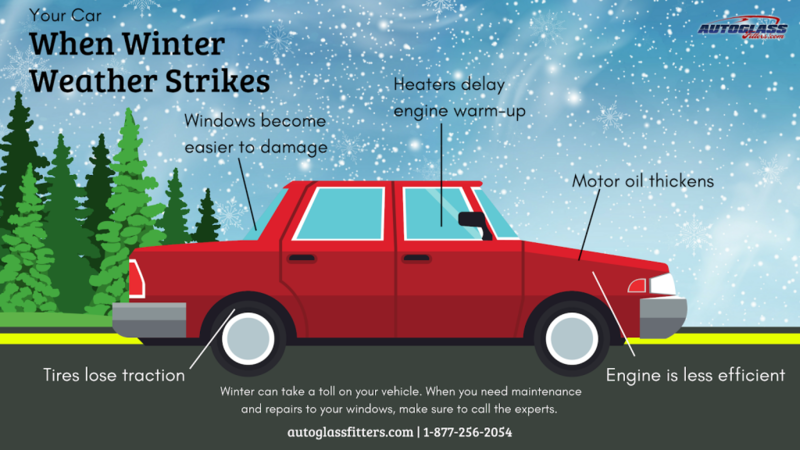 One of the most essential things you can do in the winter months for your car is make sure your windows are in good repair. At Auto Glass Fitters, we offer mobile windshield repair service in Cincinnati and the surrounding areas, so you don’t have to worry about being out in the elements while your car is getting fixed. When colder weather hits, your car’s battery needs to work harder to start up. While cold weather does make an impact, the age of your car’s battery also makes a big difference. If you’re approaching three or four years with the same battery in your vehicle, you may want to consider replacing it before winter weather hits. This will ensure that you can continue starting your car up throughout the winter without any hiccups. Tire pressure is a funny thing during the winter months. At rest, the pressure can decrease, but when moving, the tire pressure can increase slightly. It’s important in these months to make sure that even tire pressure is maintained to decrease uneven wear, shortened lifespan, and possible blowout. Due to the nature of colder temperatures, fluids, in general, become more viscous. Experts suggest, in frigid weather, to start your car up 10 to 15 minutes before getting going just to get everything warmed up. People should also consider changing any fluids, such as oil, before temperatures plummet. Keeping up with your vehicle and knowing how it can function differently in the winter months can cause extra work, but that’s part of maintaining your car. It’s important to keep up with your windows and windshields too. If you have a crack or scratch in your windshield and need mobile windshield replacement in Cleveland or the surrounding areas, give us a call today at 1-877-256-2054.